Mardi Gras holds a special place in the scheme of things for marketers. This year, it falls on March 5th. The colorful holiday arrives weeks after Christmas and New Year’s Eve holidays and there are a couple of weeks to go before Easter. So, count on this remarkable event for a unique opportunity to breathe some life into your branding efforts. The event is associated with a lot of fun and color, helping your brand gain quality visibility around town. Mardi Gras (also known as Fat Tuesday), is the last day of the Carnival season, which usually begins on January 6th every year, is followed by the Lent season. This gives folks an opportunity to have one last celebration before they enter a period of solemnity and fasting. You could highlight your office or store with decorative items usually used during Mardi Gras. Opting for plastic beads, doubloons, balloons, masks and streamers in the Mardi Gras colors of purple, green and yellow is a step in the right direction. You could also opt for promotional items from our inventory. The Metallic Beaded Mardi Gras Necklace is an excellent way to join in the festivities! Distribute this necklace among customers and employees to gain quality attention. Crawfish Boil: Crawfish looks like mini lobsters and is usually served boiled with sausage, potatoes and corn. Shrimp and Grits: Grits are cooked in butter and milk with a topping of cheese. Add shrimps on top to complete the delicacy. Creole Crab Cakes: Convert canned crab into a delicious appetizer! Pancakes: Mardi Gras-colored pancakes will never let you down! Milk Punch: A popular holiday drink in New Orleans, it is a simple connotation of milk, bourbon, sugar and vanilla. Red Beans and Rice: A classic and traditional dish with plenty of recipes to be found online! Beignets: Traditional French doughnuts can serve as effective desserts during this festive season. 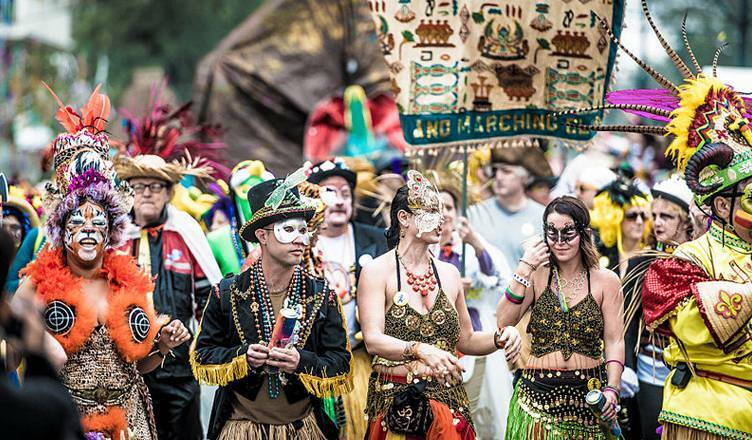 Mardi Gras music usually involves instruments such as the saxophone, clarinet and piano. You could play this music at your office or store to ensure that employees and visitors get into the festive mood. Provide employees with outfits they can wear at the office or store. These outfits will do a good job of helping people take notice of your marketing efforts. Need more marketing tips or promotional products to make your Mardi Gras promotional efforts special? Get in touch with us and we will do the needful!